‘Bristol Funeral Directors’ comprises, E.C. 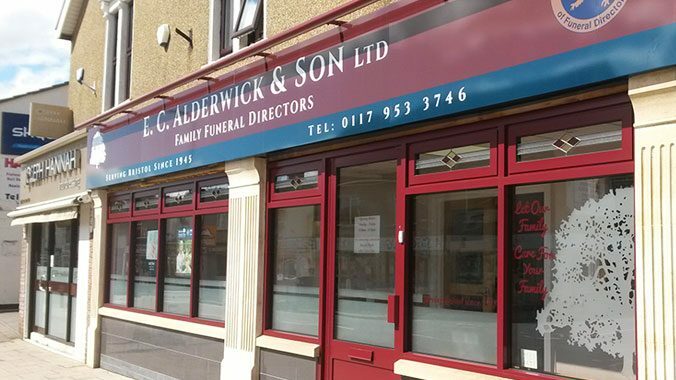 Alderwick & Son, Thomas Davis, Cotton & Sons and Bristol South Funeral Services. They are Bristol’s leading family independent funeral directors. They have been serving the Bristol community for well over a century. They operate 24 hours a day, 365 days a year, arranging over 1500 funerals annually. Cotton & Sons established in 1855, is the oldest surviving funeral home in Bristol, founded by Alonzo Cotton, a tinsmith. In 1877 his wife took a serious fall so Alonzo transported her by way of horse and funeral cart to the BRI, and in doing so introduced the idea of starting a branch of the St. John’s Ambulance Brigade. He became the Superintendent and was awarded the MBE. Capitol have worked alongside the Bristol Funerals Directors management team for several years and have been responsible for rolling out new signage & window graphics branding for most of their nine offices. The Hanham branch is the latest to receive a new look. The building itself has recently undergone a superb classical style refurbishment to the existing and the newly acquired adjacent property. Capitol Signs were asked to design and install a fascia sign that would span over the width of two shopfronts to create one office. This was achieved by creating an Aluminium box sign with the added feature of a colour matching Slim Light that ran the whole length of the sign. The shopfront window panels required an element of privacy so traditional etching was run across all windows and finished off at the entrance end with the company tree logo.